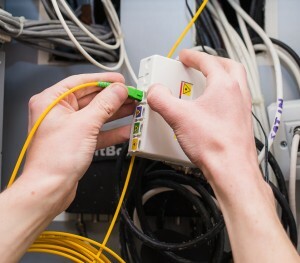 I’ve been banging on for a while about why I think the only future for Guernsey’s internet infrastructure to homes and businesses is to embrace fibre broadband, and that technologies like VDSL and 4G are limited stop gaps at best. Fortunately, there is one telecoms company in Guernsey who agrees with me, and that’s JT (I’m sure Sure will come around eventually). JT have a fibre network to supply our government buildings and schools already, and are actively interested in trying to roll it out to homes and businesses who are near to this network, to free us from the horror of spotty, inconsistent copper-based broadband. And the exciting thing is, it’s _already here;_ at least it is for a handful of lucky early trial users. Last week, I was kindly invited to visit Lance at his family’s home at Royal Terrace, to see for myself. It’s fast. Almost inconceivably fast. I had to keep reminding myself this was a real person’s house, in Guernsey, not some kind of demo ‘show house’ in some high-tech city. Lance and his family are getting a solid 1Gb/s download and 100Mb/s upload, all the time. No ‘up to’ caveats, this is a dedicated fibre line just for their home with none of the distance / interference issues you get with copper. And it’s worth remembering that these rates aren’t even the physical maximum for fibre. This was pretty cool to watch, but what you can’t see is that out of shot 2 large TV’s in the house are also streaming full HD content at the same time, and we’re also still surfing the web and downloading/uploading large files (fast) without really noticing anything’s going on. There’s no buffering; Netflix takes a few seconds to realise the bandwidth is way more than it would ever need, and before it upgrades House of Cards to the full resolution it’s capable of (which looks amazing). 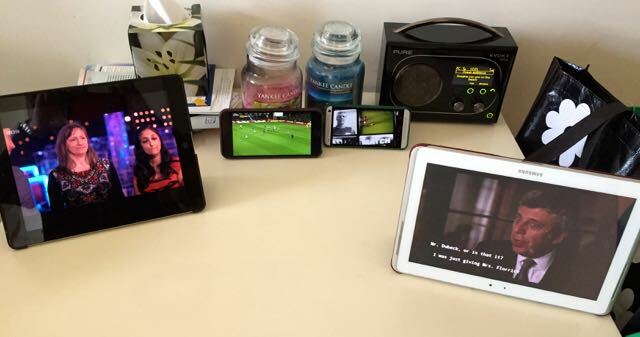 Now, clearly in this instance there are more devices than people to watch them, so this is somewhat engineered. But what it means is that Lance & family can stop thinking about internet speed, and just get on with whatever they want. Maybe 1Gb/s is still a little overkill for most people right now, but so was 512Kb/s when ADSL first came out. People change their habits and quickly take the headroom for granted. People stream data more, they back up to the cloud instead of to removable drives, they keep more and more personal video data and share it/back it up online. Maybe they work from home more often, and perhaps most companies don’t need a dedicated disaster recovery site any more, because working from home is just as fast in an emergency. There are lots of work & lifestyle changes that this sort of speed makes possible. It’s interesting that once you have extremely fast internet, you start to see the limitations of the rest of the infrastructure. The only thing that started slowing down the multi-device tests we did at Lance’s house was the WiFi, which became saturated long before the internet pipe did. Many modern houses have structured cabling (I’ve recently installed a bunch while renovating my own house), and Lance’s has this too - the TV in the bedroom was wired and once we had the WiFi saturated it happily streamed more data that way. So what’s likely to happen as more people get access to fibre is that they’ll realise they might need to upgrade their WiFi routers and maybe even think about cabling - or simply use a smaller plan (likely plan levels will be 50/100/1000 download). Also, getting to see the full 1Gb/s speed on a single device is quite hard, because only a few devices are capable of using all of it at once. You need a really fast, wired connection and a fast drive to get SpeedTest.net to report the full ~1Gb/s download - we managed it with an SSD MacBook Pro with wired ethernet, but it’s one of the few devices to manage it alone. In practice though, homes are increasingly full of internet connected devices, each one taking a slice out of the bandwidth, so the real practical improvements most people will see are about each device having a much more reliable slice of the pie. People like me have home offices and servers which we’ll connect to ethernet cables and thus be able to leverage the full 1Gb/s when we want, but most people would probably be very happy seeing a consistent 2-300Mb/s on each device regardless of what anything else is doing. That yellow wire is a fibre optic cable, and it’s 90% plastic housing & reinforcement, the actual glass fibre that does all the work is about the thickness of a human hair. The box it plugs into in the house is called the Optical Network Terminal (ONT) which turns electrical signals into laser light and vice versa. This little cream-coloured box might look a bit dull, but it’s not. It’s cool, because everything’s cooler with lasers. In turn the ONT has to be plugged into a router capable of supporting a gigabit over its WAN port. 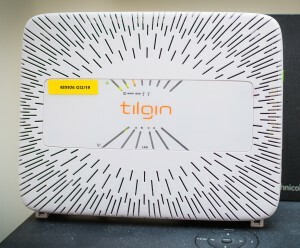 Right now JT provides these Tilgin routers but I guess there will be no reason you couldn’t replace it with one of your choice if you wanted. 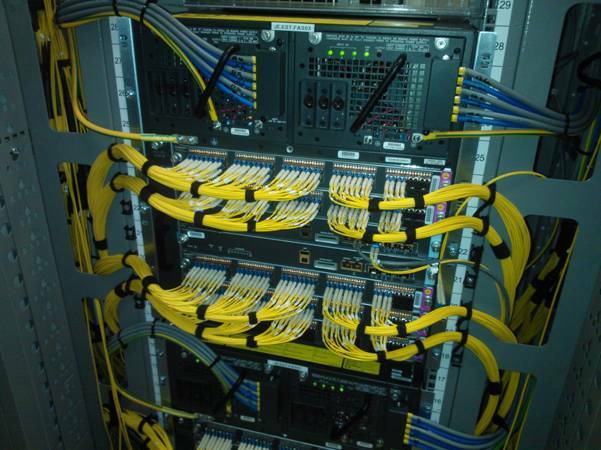 With each one of those little yellow cables delivering 1Gb/s to homes. Personally what I’d like to see is the racks in Guernsey get filled up, and more racks added. I can dream. The next phase will involve a couple more larger test sites with more homes at sensible test points along the fibre network - clos and multi-residencies are good tests in terms of bang-for-buck. Beyond that, we’ll just have to see. At all stages this is very much a test of the market, but we’re all hoping it’s going to pan out from a practical, commercial and customer demand stand point. 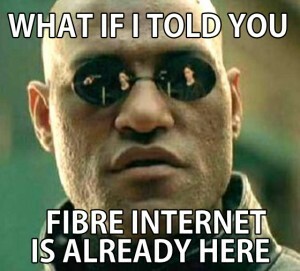 I’m going to carry on being a bit of a cheerleader for this, because as you know I believe strongly that starting to roll out fibre to everyone is the only realistic option for Guernsey not to get left badly behind in the world in the next decade or two. To be clear, I have no commercial association with JT, and indeed right now my internet and mobile are with Sure 😀Similarly JT don’t tell me what to write, or edit / vet my comments here or on Twitter. But I’m supporting them in this because they’re willing to try to push the boundaries out in ways that I wholeheartedly agree with. My hope is that eventually Sure will realise they have to start providing fibre options too, so that we can have a competitive marketplace on this, but so far they’ve stonewalled on that, claiming VDSL is fast enough for everyone (my response: see Bill Gates’ 1981 quote on 640K 😉 ). As it is, Sure have been unable to even deliver VDSL to me at either of the houses I’ve called home in recent times, neither of which is exactly ‘out in the sticks’ (south St Peter Port & Cobo village), so it’s very much an empty claim to me. Until they change their minds, I’m helping JT as much as I can under the grand principle of mutual self-interest.